When we were still in college, my now-husband turned to me and said, “Hey. Let’s buy a boat and go cruising.” Knowing nothing other than that I liked sailboats, I agreed. What’s the first step to going cruising? Living on a boat. Living on a boat sounds so romantic. Waves gently lapping the hull, stars twinkling overhead. The sense of freedom and solitude. Like any dream, though, there are questions to be answered before you get to the point of living on a boat (living on a yacht sounds even better!) full time. What is this liveaboard life like anyway? You definitely need to think about why you want to do this, and there are a few practical questions that need to be answered before you take the leap and buy your boat, but I can tell you from experience it’s worth every bit of hassle. Why do you want to live aboard a boat full time? People choose to live on boats for lots of reasons. You might want to think about what your rationale is - are you a rebel, ditching what society thinks of as normal? Are you looking to downsize, longing for simplicity and minimalism? Are you hoping to save lots of money on rent or a mortgage in an area where housing is crazy expensive? Are you dreaming of seeing the world from your own cozy home, and the living aboard is just the first step in that bigger vision? Understanding your WHY is key to making better decisions about this boating lifestyle. Can you live on a boat in your area? Boats mean water, and even if you’re not living by the ocean, you may still be able to live on a boat. Large lakes or bays and even rivers might support your dream. You’ll want to investigate the possibility for where you are. Drive around, look for boats, and introduce yourself and ask questions! There are parts of the United States and the rest of the world where local regulations prohibit living on a boat, and still others that closely limit the numbers of people who are allowed to live aboard full time. If you can’t live on a boat in the area where you live, then perhaps a move is in your future. This article is a bit outdated, but it outlines some of the challenges with localities and living aboard. Make sure you research! What makes a boat a liveaboard boat? There are as many answers to “what’s the BEST boat to live aboard on” as there are people, but in general there are some basic needs. There needs to be a cabin, with a roof (not just an open cockpit you string a tarp over.) You need some basic living accommodations, like a bed and a head (a toilet) and at least a rudimentary kitchen, even if all it is is a counter with a microwave (though I’d argue you need at least a single-burner cooktop of some kind.) You will need some kind of water system. Details after that are up to you! Chapter 2: What kind of boat do you want? After you’ve figured out WHY you’re thinking about this and IF you can live aboard in your area, the next question to answer is what is a good first boat to buy. You don’t have to buy a boat - there are creative ways to make this dream happen without plunking down a ton of money - but it is definitely the most practical. There are not a lot of boats for rent (other than charter boats, which are prohibitively expensive for long-term living unless you’ve got a lot of money), and you can find older boats for not a huge investment. So what boat types should you look at? What boat is right for you? In general, you’re looking at just a couple of options, at least to begin with. Motorboats or sailboats? Monohull or catamaran? (Or trimaran). Let’s take a look. So many kinds of boats! Motorboats can be less scary than sailboats, especially to someone who’s not used to sailing. It’s a boat with a motor, which is kind of like a car, right? No extra stuff to learn about or deal with. You’re not likely to live on board your little fishing boat, though - so what motorboats are out there that people are really living on? Motorboats, whether you’re talking about a trawler, a barge, a tug, or a houseboat, tend to have more living space inside than a sailboat of a similar length. Because you move by way of engine, there often is more capacity for electricity generation, and the amenities on a motorboat more closely mirror those found in land-based living. If you are talking about traveling on this boat you’re living on, you’ll quickly find that motorboats use more fuel than sailboats, and they may not be as stable in rough weather (but that is very dependent on the boat you’re talking about.) Still, motorboats are a very valid choice when you’re thinking about what the best boat is to live on. If you start digging a little into the liveaboard lifestyle, you’ll likely hear about trawlers. These are displacement cruisers, which is a fancy way of saying you won’t break any speed records; the focus is on fuel efficiency, not speed. These boats tend to look a bit like workboats, with wide decks to walk around and a spacious living area inside. They often need less water to be able to float, meaning you can keep the boat tucked in closer to shore or find a dock that isn’t super deep to keep it. Captain Greg Parker, in this article in PassageMaker, argues (convincingly) that a trawler is a “power vessel that accommodates the cruising lifestyle.” In some areas around the world, trawlers are the kind of motorboat you’ll see more people living on than any other. A power catamaran is the next kind of motorboat to think about. Basically a boat with 2 hulls, a power cat is just what it sounds like - a catamaran with no sails. You have the benefits of a two-hulled boat (stability, space, speed) with the drawbacks (costs, complexity). There are not so many of these, particularly not so many on the used market, when compared to trawlers. If you want to travel around and are looking to have a lot of living space, this kind of boat might be high on your list. In Europe, where a lot of boat travel is done on inland canals with lots of locks and bridges, a barge is a common kind of liveaboard vessel. Shallow draft and maximum living space makes this an attractive choice if you’ll mostly be living or traveling in protected waters like the canal system. Finally, there are more than a few converted work boats that people are living on. Tug boats have an appeal that is underlined by the ruggedness of the build quality as well as the ability to move steadily through rough seas. The other large category of boats to live on is sailboats. Like motorboats, sailboats come in all sizes and shapes, and what particular one to choose is the topic for a whole different article. Sailboats are designed to move, not to sit at a dock, and their sails make it possible to travel without using the engine. There are numerous books and stories about people sailing all the way around the world on a boat with no engine; you can’t pull this off with a motorboat. The storage on a sailboat is often compact and ingeniously laid out, which can be a kind way of saying you have to move things (sometimes bulky cushions and floorboards) to get at it. The romantic appeal of a gleaming sailboat gliding along with white sails spread out like the wings of a bird is undeniable, but those sails (and attendant masts and rigging) add complexity to an already-complicated set of systems. When you’re buying a sailboat to live on, there are some questions you need to ask yourself, and chief among them is what kind of boat to buy. The debate about monohull vs multihull (catamaran or trimaran) rages on; it won’t take long on a sailing forum to find the argument flying. Both kinds of boats have their good points and things to approach with caution. A monohull is a boat with a single hull, and this probably what you think of when you think of a sailboat. They range in size from tiny (a 5’4” sailboat crossed the Atlantic once) to over 200 feet. You’ll find lots of options in the 30-55’ range. Drawbacks to monohulls include more limited living space for the same size boat, the fact that they heel (tip) over in a breeze or in heavy seas (or when someone steps aboard! ), and the deeper draft they need to sail well if you’re planning to cross oceans. There are many, many monohulls on the market, both new and old, and if you’re on a limited budget you will find far more choices if you’re willing to be on a monohull than a catamaran. Monohulls are much easier to find space for in a marina and that space will be cheaper, which can be an important consideration when looking at the overall cost of your adventure. Monohulls come with a variety of rigs, all of which (like the kind of boat you buy) have pros and cons. I’ll define them here just so you know about them; there’s not space in this article to get into more detail. There are variations on a theme too, but these are the ones you’ll run into most often on listings. The more masts there are, the more sail combination options you have but the more rigging (and costs) you have to deal with. Multihulls (catamaran - 2 hulls, or trimaran - 3 hulls) are becoming more popular, particularly for the charter (vacation liveaboard rental) market. The amount of living space, the tendency to stay flat in rolly anchorages or at sea, and the appeal of a shallower draft (to tuck in closer to the beach) is irresistible for many people, and if you have a large family to live with it’s hard to argue otherwise. Multihulls often are very wide for their length, offering incredible living space; this same space makes them difficult and extremely expensive to find a marina berth for. They are also much more expensive for the length boat, making it more of a challenge to find one if you’re on a tight budget. 2 hulls also often (but not always) means 2 engines, at least 2 heads (toilets), and more complexity in systems. Multihulls have the reputation for sailing faster than monohulls, at least downwind, but the availability of space to store things in (and the resulting piling on of STUFF) can compromise the sailing ability. If you are not planning to travel, this may not matter at all. If money were no object, though, the liveaboard catamaran lifestyle is closer to that of living in a small apartment, which can be really appealing. In an anchorage, the party is usually on a catamaran; they just have that kind of space! The space is hard to argue with. Check out the video to see what I mean! Chapter 3: What size boat should I buy? After figuring out what KIND of boat to buy, the next big question is what size boat to get. And in case you hadn’t figured it out yet, the answer is “It depends.” Sure, your budget will dictate some of this, but there are a lot of other questions you need to answer to get to the heart of the matter. You’ll need to figure out the bare basics of the space you need, and this actually has a lot more factors than just “what’s the best size boat to live on?” It’s about the number of people (and pets) aboard. The way you want to use the boat. Whether you’ll be needing to work from the boat. Where you’ll be living - and that all-important consideration of weather. Like a lot of questions, boat answers are not as simple as they first appear! One of the first questions you need to answer is how many people are going to be living with you. Maybe you’re a single person; maybe you’re a family of 6 with 2 dogs. Chances are reasonable that if you’re living alone, you will likely be happier with a smaller boat than someone who has other living beings to consider. How will you use the boat? 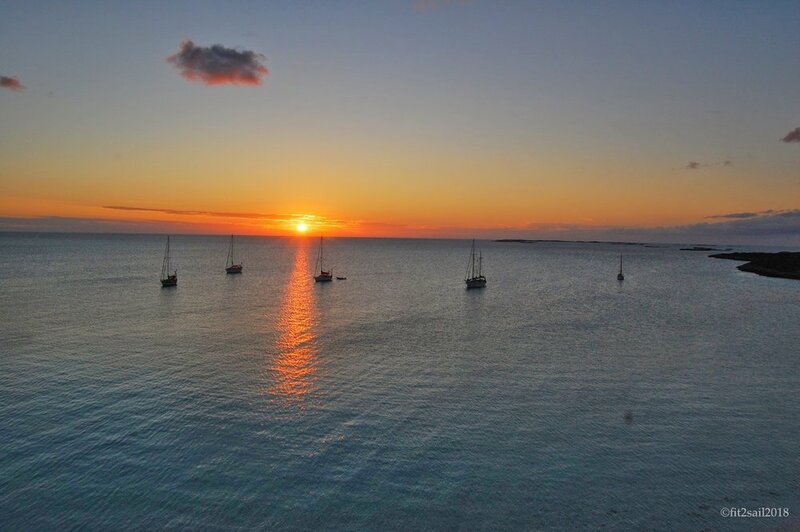 If you are trying out this liveaboard lifestyle because you think you’ll head off sailing into the sunset, you may find yourself wanting a smaller boat than if your plan is to stay tied to the dock. You’ll read a lot about maintenance, strains and stresses on equipment, and the costs of a larger boat especially when actively cruising, and you may decide a smaller boat (paradoxically) is a better one for crossing oceans. Are you working from “home”? If you will be working from “home” (the boat) and need a home office for tax purposes, or just need a space to have your work “stuff” close at hand and not disturbed, your need for a separate cabin for this work might top your list, making the boat need to be that much larger or at least the layout either already conducive for that activity or easily customized to find a spot. And finally, the climate will likely influence the size boat you choose. A climate where the cockpit can extend the cruising season because you can be outdoors a lot might allow for a smaller boat than one where you really need to be down below at all times, either for heat or air-conditioning. Chapter 4: Where can I park my boat? Okay, it’s not called parking - it’s called docking or anchoring, but once you’ve answered some basics about the space you NEED, you’ll have to look at your local area to see where you can keep the boat. Pretty much you’ve got two options - you can keep your boat at a dock somewhere, or you can anchor. Both have their highlights, and both have their drawbacks. If you want to keep your boat tied to land, your options are a marina or someone’s private dock. Either way, you’re going to be paying someone for the privilege of doing this (unless you purchase a slip, which is another option.) The plus side of being at a dock? You have very easy access to land. Step off the boat and there you are. Most marinas have parking included, a handy amenity if you have a car that you need access to frequently. And the ease with which you can socialize with your neighbors is not to be underestimated. Calypso at her home dock. There are marinas in many places where the availability of a large slip (boat dock) is limited or has a years-long wait list. In such places, having a smaller boat (and this can be a relative term) means you can slide into a coveted marina berth easily while someone with a larger boat has to wait. If you want to be in a certain marina and have a time frame in mind, you might find yourself choosing a boat that lets that happen. Keeping your boat at a private dock is often a matter of being in the right place at the right time, so if this is your preferred option keep your ears open and put out feelers to anyone who might be able to help you. 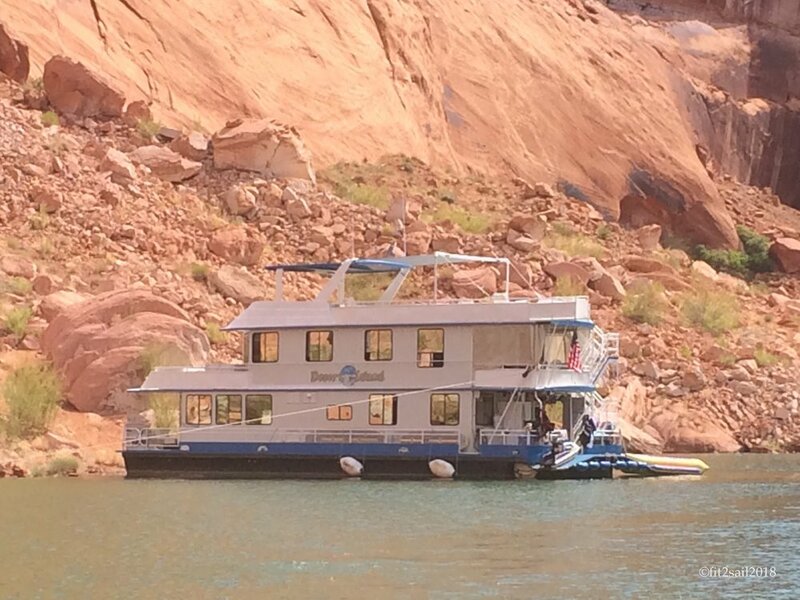 This may well be a cheaper option than being in a marina; the amenities are likely to be fewer as well. But let’s say you aren’t planning to live in a marina. You are the anchoring type, excited about living life on the hook. Anchoring is a great way to save money and to really increase your privacy, and people who think that the liveaboard lifestyle is free are likely thinking of the scenario where you put your anchor out and pay nobody for the privilege. This is true in many places, but not so much in others. And in any case, you’ll still need access to shore (grocery shopping, trash disposal, mail) as well as a way to take care of your holding tank. Both of these amenities will very likely cost you money. Living on the hook (anchored) will require that you have some means of getting to shore. This means a dinghy, generally, unless you’re in an area with a water taxi or a shore launch. A dinghy is a smaller boat you use to move more freely, kind of like a water-based version of a car. You don’t move your house around, you travel in your car - that’s what a dinghy is. Your cruising car. Like a car, a dinghy is not free, unfortunately! Chapter 4: How much does the live aboard boat lifestyle cost? By now you can likely chime in with me when I say those lovely words - IT DEPENDS. That said, there are indeed a few things you can consider when contemplating whether this lifestyle will work for you. Unfortunately, living on a boat is not free. Like living on land, there are certain categories you’ll have to factor in! Can you get a boat mortgage? Just because a boat costs a certain amount of money doesn’t mean that’s what it will cost you. Some boats are eligible for mortgages, meaning there are lenders who will treat a boat kind of like a house - and there are some US tax benefits as well, if the boat meets certain criteria. It’s rare to find a lender willing to loan money for an older boat, so if your budget requires a mortgage, you may be looking at newer boats that are smaller than you might have wanted. Mortgage rates on boats are quite a bit higher than they are for houses, and boats don’t tend to appreciate in value. Be very careful if this is the route you choose and understand well what you are getting yourself into. There are a couple of instances where boat insurance will be required. If you have a mortgage on the boat, your lender will require certain levels of insurance as a safeguard against their investment, and if you will be living aboard in a marina, the marina will require something similar. The amounts may well be different, so make sure you’re covered to the higher level. If you don’t fall into those categories, you can choose to go without insurance, though I’d advise at the very least to carry liability insurance in case of an accident with a much more costly boat. The cost of insurance varies greatly depending on where you are geographically, the age and size of the boat, and even your boating experience. Read the fine print very carefully as far as exclusions and requirements. If you are living aboard your boat and using it as a floating apartment, going to a job and sending the kids off to school every day, you’re likely to be living in a marina. The costs for this vary tremendously depending on what marina you choose, even for the same size boat. Marinas charge higher fees for nicer amenities (showers and laundry facilities, floating docks, wifi at the dock, public spaces with grills and manicured lawns, gated access to the docks) or for the location (closer to public transportation or to the center of town). You will have to decide what is important to you when thinking about what marina to call home. If you are in a location with a high percentage of visiting boats, you’ll find different rates for transients (people who are just staying a few nights) and for long-term stays. The cost can vary considerably, but you’ll see rates advertised as by the foot or by the slip size. Make sure you are comparing similar rates, or make the conversion yourself. 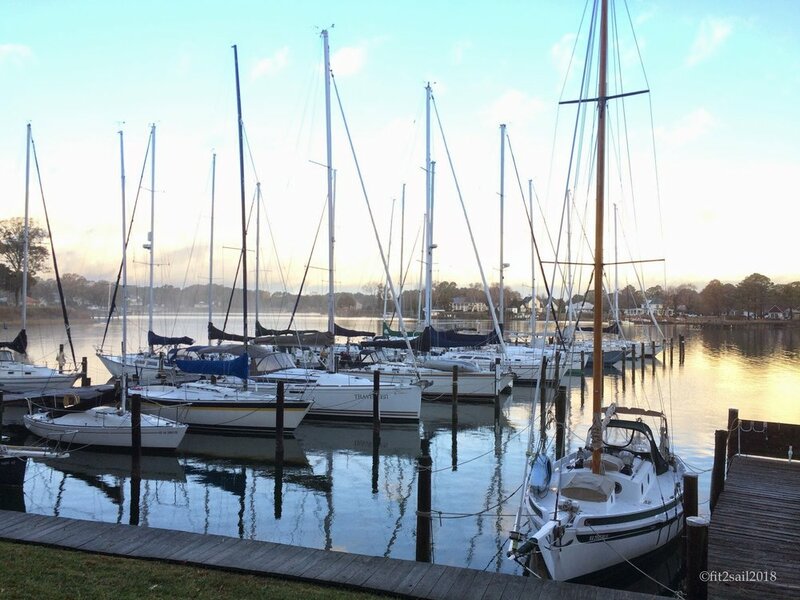 In the southern part of the Chesapeake Bay, on the east coast of the United States, my local marinas advertise rates from $1.50 per foot per day to a flat rate of $4800 per year, with a huge break given to someone who opts for a year in advance. Many marinas charge a liveaboard fee in addition to the slip rent. This is generally shown as a flat rate per month. You will have to ask about what is included in this fee as it may not include a whole lot other than paying for the privilege of living at the dock full time. You will generally still need to budget in things like electricity and wifi, as those amenities are not usually included in slip fees. Wifi may appear to be included, but the signal strength can be spotty at best especially if your slip is far away from the office. Maintenance needs to be a line item in your budget, though how big this is will depend on your skills, your available time, and the complexities and size of your boat. Unlike a house, a boat is constantly moving and wearing, and things break with surprising frequency. A rule of thumb for maintenance is 10% of the value of the boat per year, though this varies with the boat as well as your capacity to fix things. The hidden part of this number is that it’s rarely a flat 10% per year, but rather an average spread out over time; it’s a good idea to set aside a rainy day fund and add to it regularly. You may be used to living in an apartment where all utilities are a part of the rent, and while you may find this to be the case in your marina, more often than not you’re the one who will be paying for your utility usage. If you’re living at anchor, you’ll DEFINITELY be responsible! When you’re figuring out what your budget needs to be, factor in electricity (metered at your slip, or the cost of running a generator or the alternate energy source you have on board), wifi (you source it and make sure you can access it yourself - a phone hotspot is a popular option), water (often a flat fee per month, or a cost per fill up at the local dock), and laundry (coin or token-operated, sometimes at the marina or a local laundromat). If your stove is propane, you’ll have to figure that in as well. If you are living at anchor, you will need to factor in regular pump outs (a way to empty the holding tank, which is where the toilet waste goes on board) as well as access to a dinghy dock. Many locales bundle the two options together along with a legal place to get rid of your trash, and perhaps access to a shower on shore. Chapter 5: How to pay for it? Option 1. If you can afford to rent, or buy a house, then you can likely afford to live on a boat full time. This doesn’t mean you’re buying a boat in addition to the house, but just that you’re trading the cost of one for the cost of the other. The key here is LIKELY - as with anything boat, it depends. Look at all the details in Chapter 4 and tally it up. If you are working with income coming in, and you have to live somewhere - this might work well for you. You may have saved up a lot of money and have decided you’re just going to try this boat living thing for a while. This is the way a number of people get started with the liveaboard lifestyle, and there is something to be said for the discipline you’ve shown to be able to get to this point. Track your expenses, make sure you don’t choose a boat that’s too expensive to make it work, and enjoy this way of living in the world. There are a number of people who have taken full advantage of the internet era and are digital nomads, living where they wish and working from wherever they are. They’re location-independent for work (though they are internet dependent, which can be challenging on a boat even in a marina in a city) which means they can choose to live wherever they want. This can be a fabulous way of making the liveaboard lifestyle work for you. Chapter 6: What are the downsides to living on a boat? There are, of course, drawbacks to living on a boat. Some of them you may have already considered; some of the ones talked about here might actually fall in the plus category as far as you’re concerned. Living on a boat means living in a space smaller than most apartments you’ve considered. Boats aren’t rectangular, but if they were, a 40 foot boat that’s 14 feet wide would still only give you 560 square feet of space. That’s not a ton of space to fit in all you need in the world, especially if you’re sharing with other people. And a 40 foot boat is a pretty decent size vessel. Add to this the fact that, especially on a monohull, the storage is tucked away places that require a bit of contortion to access - a boat can feel pretty small indeed. Storage is often UNDER something else. If you are in a marina (or even in an anchorage), you don’t have control over your neighbors. You will hear them, see them in all their glory (whether you want to or not), smell their food, and see how they keep their home tidy (or not.) If you’re in an anchorage, you can pick up and move, but that can get tiresome on its own, especially if you’re staying put and not traveling. Boat life can be hard on the boat. Everything is constantly moving, constantly wearing. Your hatches might leak in hard rains; the engine might break just when you want to head off somewhere. Fixing things in a small space, where you have to clean up just to be able to go to sleep, can be frustrating. Appliances that break on a boat (think toilets, fridges, even air conditioners if you have one) are not as common as household appliances, and they cost more to repair. Living on a boat is a lifestyle many cannot understand at all. If you are choosing to travel around, this is even more pronounced. Society is geared toward doing what is “normal”, which to the vast majority of people around you means living in an apartment or a house that has space for guests and a lot of stuff, driving a car to work every day and, if you’re lucky, relaxing on the weekends with yard work and soccer games. It takes a mindset shift to acclimatize to life in a small space and its complications; don’t expect colleagues or land-based friends to understand when you complain about the neighbor’s halyards clanking keeping you up at night or the high tide keeping you from getting off your boat. It’s beyond the realm of reality for a lot of people. Chapter 7: What are the best parts of living on a boat? Sure, there are challenges. But living on a boat has its ultimate perks, too. Every night, without fail, whether you’re in a marina or in an anchorage, you’ll hang in the cockpit and watch the sunset, often with friends sharing your space and the view. The time you take to appreciate something so incredibly special is not to be believed. Since all your neighbors are boat people, the “pay it forward” philosophy is alive and well. Boaters are always willing to lend a hand, whether it’s helping lug groceries down the dock or assisting in the middle of the night if your anchor drags. There’s much more community on the water than in many places these days, and it’s rare that you won’t make friends very quickly. Your neighbors will be your confidants, your buddies, your emergency hands, and your sounding board. And the view? Need I say any more? You live in your house, and that house can move. There is something incredibly powerful and freeing about having that knowledge, even if you never actually put it into practice. The possibilities are endless - anywhere there is water, you can go. That’s the fodder for some really awesome dreams right there, dreams that don’t feel all that far out of reach. Simplicity is all the rage these days. We look around and there is stuff everywhere. We’re constantly barraged with ads to buy this, have that, add this to your life. Gadgets you can’t live without, the newest fashion that needs to be stuffed into an overfull closet. When you clean out your life to live on just what you need, it feels incredibly free. Getting dressed in the morning is easier when you don’t have to wade through endless options. Cooking is back to basics (delicious basics!). Life on a boat is all about how little you need to live well, not how much you need to compare yourself to someone else. The tiny house movement is a testament to the desire to live more simply, to have less stuff. To me, boat living is the precursor to any tiny house movement, with the added benefit of so much outdoor time. When there are no walls interrupting your view, the world feels more open, with all the space you need. It’s liberating in more ways than one. It’s easy in a house to depend on other people. You hire people to paint, to clean, to fix the fridge or mow the lawn. Sure, maybe you do all of those things yourself - but on a boat, chances are better than average that you WILL be doing them all yourself. But it’s not just the maintenance. It’s the everything. Want electricity? You figure out the electrical system on board, including the batteries, the charging capability, and the capacity. You’ve spent time figuring out how much power you need to live the way you do, and you figure that into the system. Maybe you’ve got alternate power, like solar panels or a wind generator; maybe you’re plugged into shore power. Maybe you use a generator, or run the engine every day. Whatever the options are, you’re the one deciding on what works for you. Your water system is the same thing. You’ve got water tanks, and a way to get that water into them. Maybe it’s a hose, maybe it’s jerry jugs from shore. Maybe it’s a watermaker, if you’re in a place with clean enough water to make that feasible. I remember during one hurricane here in Central Virginia, when we were without power for 6 days. If we’d been on the boat, we’d have gone through life as usual, no blips in the way we went about our days. That’s what I call self-sufficiency! Is living on a boat all fun and games, sunsets and cocktails? No. But the challenges are more than offset by the rewards if you are honest with yourself about what you’re getting into. Here’s hoping this article has helped you see some of the questions you need to answer and some of the mindset shifts you will need to make. And I hope to see you, walking down the dock on your way home, soon.